WITH SCHEMABINDING optimizations were added all the way back in SQL Server 2005. So why bother talking about them in 2018? Because no one is taking advantage of them! Ok, maybe that’s a little unfair. I’m sure some people advantage of the optimizations, but most code I see posted online that could benefit doesn’t include it. So let’s talk about an easy way for some of our non-data-accessing scalar functions to get a performance boost. When you create a function or view, you can add the WITH SCHEMABINDING option to prevent any database objects that the view/function uses from being modified. This is a pretty cool feature which prevents you from making a table or column change that would cause a view/function to break. And while that’s pretty cool functionality on its own, what’s even better is that the SQL Server optimizer can do some pretty cool things when it knows one of your non-data accessing scalar functions is schema bound. When SQL Server executes a function, by default it checks whether the function has any database objects it needs to access. For our example functions above, this is a waste of time since neither function accesses any data. CPU time = 1594 ms,  elapsed time = 1977 ms.
CPU time = 62 ms,  elapsed time = 59 ms.
Take a look at those CPU times: 1594ms vs 62ms! Since SQL Server saves a LOT of time by not having to verify the underlying data sources (for a more in-depth explanation of how SQL Server checks whether a function accesses data, I highly recommend reading this StackOverflow answer by Paul White). In this example, you’ll notice our non-schema-bound function introduces a Table Spool while our second schema-bound function forgoes this addition since SQL Server knows there won’t be any potential for conflict. 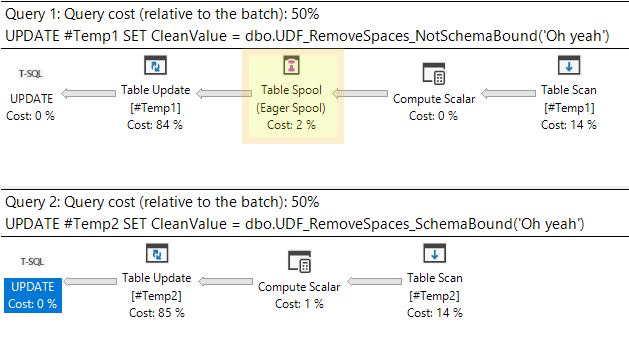 In conclusion, if you have a non-data-accessing scalar function you should always add WITH SCHEMABINDING to reap the benefits of SQL Server’s optimizations when available.